Al Khobar-based Power Weld Trading Company, the exclusive distributor and service provider for Japanese-made Shindaiwa power equipment, plans to expand its base from the Eastern Region to other parts of Saudi Arabia. 'We are planning expand our business line and presence all over the kingdom with a one-year period,' says Mohammed A Hilal, operations manager, Power Weld. 'Although the economic slowdown as a result of falling oil prices has affected the industry at large, we are optimistic and hope to win orders from new projects especially in Jubail, Jizan and Turaif,' he says. He says the Shindaiwa brand is synonymous with high performance and durability around the world. This is proven time and again by testimonials from commercial customers who use the company’s products under extremely harsh conditions. After years of reliable use, they come back for another Shindaiwa because of the consistent quality and dependability they have come to expect. By launching Shindaiwa on the market Power Weld has unveiled a new era in the welding world by introducing the most sophisticated, real-dual, sound proof welding and power generators. 'Currently we are focusing on welding generators from 220-500 Amp and power generators from 25 – 100 KVA. Besides that we have a complete range of welding consumables, torches and other accessories,' he says. 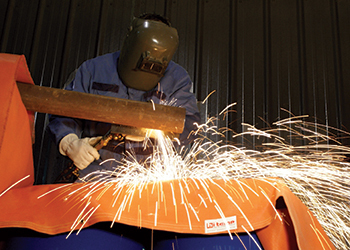 Power Weld is committed to after sales service, warranty, spare parts support and training programmes for the development of welder’s skills and improvisation in day-to-day operations to keep the clients satisfied. Since it started the new Shindaiwa division the company is in the process of brand building and promoting awareness of its identity and products. Power Weld’s high-tech facilities and multi-faceted staff in sales and marketing offer the best to its valued customers by promoting its product line and after sales services. 'We are optimistic and confident about our company’s strengths and product line, but in the current market situation we may need to be patient, more focused and committed to our goal,' he says.